Book 3 in the Cutthroat Business mystery series, featuring Southern Belle and Realtor Savannah Martin in Nashville, Tennessee. Absence makes the heart grow fonder, they say, and Realtor Savannah Martin is certainly learning the truth of that statement. It’s been a month and a half since Rafael Collier left town, after the robbery ring he was part of got broken up by the police, and although Savannah knows it would be hideously inappropriate—not to mention supremely stupid—to miss him, she wishes he’d come back soon. His grandmother’s ailing, the nurse he hired to take care of her has disappeared, and somebody is watching the house and following Savannah as she goes about the business of bringing her first real estate transaction to a close. But when Rafe comes back, things only go from bad to worse. Resident nurse Marquita Johnson is found murdered, and Metro Nashville Homicide Detective Tamara Grimaldi is asked to handle the case. It doesn’t take long for her to focus her interest, once again, on Rafe. As Savannah finally learns the truth about him, she finds herself in the path of a killer more ruthless than any she has encountered yet, a killer who won’t be swayed from his purpose and who isn’t too particular whom he has to go through to get to Rafe. 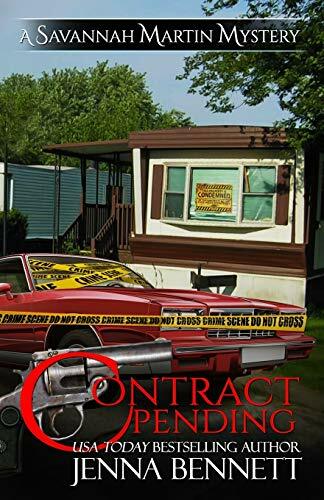 Now Savannah has to make the choice between staying safe by accepting Todd Satterfield’s proposal, or taking a chance on losing her heart and her life by trying to help Rafe, as the term ‘contract pending’ takes on a whole new meaning.